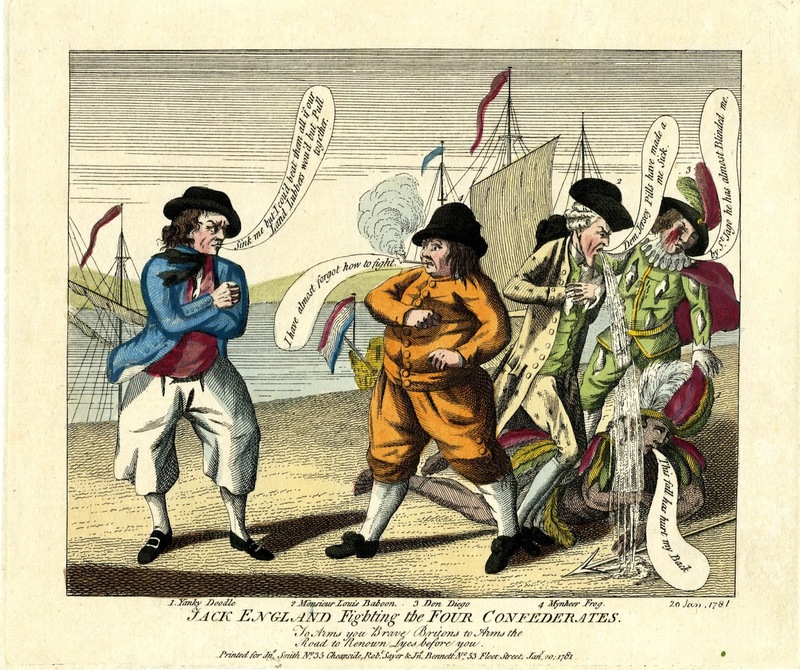 Jack England Fighting the Four Confederates, John Smith, 1781, Lewis Walpole Library. 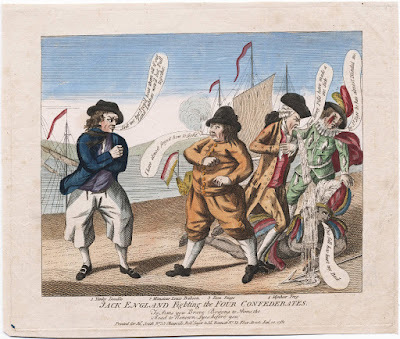 Jack England Fighting the Four Confederates, John Smith, 1781, British Museum. Our title character and personification of the empire stands bow legged, with his arms crossed as he confronts the caricatures of "Don Diego" (Spain), "Monsieur Louis Baboon" (France), "Yanky Doodle" (America), and 'Mynheer Frog" (the Dutch). Monsieur Baboon turns to puke, Yanky Doodle falls, and Don Diego reels with blood dripping down his face. Mynheer Frog stands alone, but not confident, exclaiming "I have almost forgot how to fight." 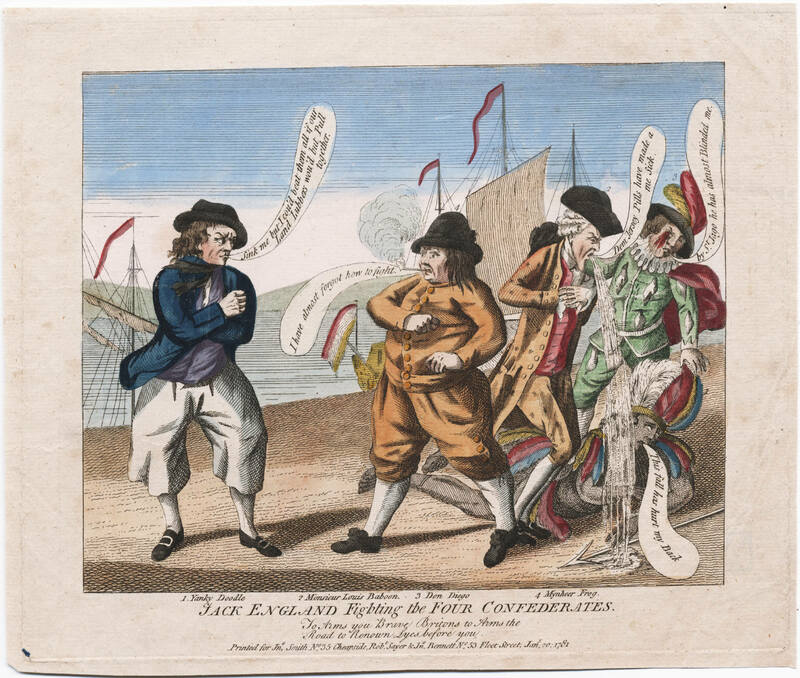 Jack England is ready to fight, but laments, "Sink me but I cou'd best them all if our Land Lubbers wou'd but Pull together." This may be Smith's commentary on the frustrations the army was facing in North America, or on the failure of politicians to effectively lead the fight. Jack England wears a black round hat with a short brim, beneath which flows hair cut just above the shoulders. He wears a black neckcloth, tied into a knot at the front. In the Walpole copy his double breasted waistcoat is purple, and it is red in the British Museum's piece. In both it ends below the waist, and is fitted with cloth covered buttons. Jack's single breasted blue jacket (a sky blue in the British Museum copy) has no pockets, and his mariner's cuffs are buttoned shut. In a testament to the changes a colorist can make, the Walpole version is painted blue on the inside, and the British Museum version is white, meaning that the British Museum's version is a lined jacket. Beneath the jacket and waistcoat is a pair of petticoat trousers/slops with a broad fall fly. His stockings are white, shoes have rounded toes, and he wears rectangular buckles.